Here is the adorable beach bungalow you've been looking for. Located on the southern border of Laie on the north shore of Oahu, this old-time beach cottage was lovingly restored back to original. The 425 square foot private cottage has a front deck of 150 square feet with a stainless gas grill, a table & chairs with a shade cloth canopy, plus a tropical landscaped front yard with native plants and tropical flowers, that sits on a fenced lot. An over-sized walk-in tiled shower, double bowl vanity sinks in the bathroom and air conditioning throughout, is perfect for the honeymoon or anniversary getaway. There's a convertible loveseat(sleeps an extra guest - small child - if need be), a roomy fully stocked kitchen with glass top range/oven for cooking in, free wifi, laundry, parking and beach equipment to round out the benefits. This rental is just a short walk from a beautiful long stretch of secluded sandy beach (the beach access is at the end of the lane, about a 45 second walk away). It's perfect for strolling, swimming, and snorkeling with restrooms and showers close by at Kokololio Beach Park. The Polynesian Cultural Center (with its luau dinners and hula shows) is just a few minutes away. The LDS Temple is in Laie and a visit to Laie Point offers a dramatic view of the rugged coastline. A bit further down the road is the Malaekahana State Recreation Area, with views to Goat Island and a sea bird sanctuary. The Turtle Bay Resort is just 10 minutes north with two amazing chamionship golf courses designed by Arnold Palmer and is a nice place for lunch, cocktails, or dinner. Continue north and you will run into the famous North Shore surfing beaches and famous Haleiwa Town with a lot of mom & pop store shopping and restaurants. Whether you decide to relax at the bungalow, or drive around to sightsee, you are sure to have a fabulous time. Make sure you click on 'View My Other Listings' at the bottom of this page for rentals in Kailua, Oahu and Volcano on the Big Island. If you're interested in staying in more than one of my rentals, I can provide you with a rate for your vacation package. My wife and I love this beach property. It's so close to the beach, restaurants and grocery stores. The small town feeling and tight community on this beach lane is familiar since we both grew up in a small town, on a cul-d-sac on Oahu. The beach is great. Never really rough, even in the winter when the North Shore surf spots are reaching 25 feet. A perfect beach for swimming and boogie boarding. The large shower of the Beach Lane Bungalow rental is my favorite. Fully tiled with additional access to the shower the moment you step in from the back bungalow door. The bungalow is very much suited for a honeymoon or anniversary getaway. Double vanity sinks and extra large tiled shower...perfect for two. Enter into the bungalow tiled shower from the back door. Sometimes, at night, you can hear the waves crashing onto the shore. On the other side of the coast road is the majestic Koolau Mountain range. A very popular mountain range hike is nearby on a state marked trail that will take to the top where you will have a breath taking view of the entire windward side of Oahu. The quiet split air conditioner is large enough to cool the entire bungalow efficiently. High quality thread count linens are there for both the sleighbed and the convertible twin bed. Top load washer, Free laundry...detergent is provided. Front loader dryer, Free laundry...dryer sheets are provided. Free parking right in front of the bungalow. Fully stocked full kitchen with all the small appliances you need plus a full-size fridge and range/oven. Manicured lawn with tropical flowers and coconut trees. Kayak rentals are available in Haleiwa town, about a 25 minute drive away. Or you could have the company drop it off at my bungalow. You can rent bicycles and have them dropped off at the bungalow. Deck has a gas BBQ grill, a table and chairs with a shade cloth canopy above for outdoor dining. Boogie Boards, Beach Chairs, Beach Mats, Coolers & some snorkeling gear is provided. Tennis can be played at the BYU Hawaii College a 5 minute drive away. Kahuku Golf Coarse is a 8 minute drive away. The more expensive Turtle Bay Resort Arnold Palmer Coarse is 15 minute drive away. The stay in Greg’s cottage was great. Beautiful location, close to the beach. The beach was like our own private beach where you could boogie board, snorkel. There were a couple of things that the cleaner had forgotten to do prior to us getting there. Overall though, those things were not a big deal and I really loved staying at Greg’s cottage. Mahalo for your review Kelly and I'm glad you loved the cottage. My cleaner felt terrible about getting her dates mixed up. She cleaned the bungalow and washed all the linens prior to your arrival but she thought she had another day to put the folded linens away, etc. before you checked in. We had a wonderful stay ... cozy, clean, relaxing and close to everything we needed! We ate at the nearby recommended places like Papa Ole’s, Seven Brothers, Angels Ice Cream, and then spent the remainder of our time at the beach - swimming and running ! My husband and I enjoyed our return trip to this beautiful romantic beach bungalow so much we can't wait to book our return vacation there for next year! The private access to the semi-private beach is picturesque and a perfect way to start and end every day of our vacation. The location was also convenient to the nearby market and drugstore too, for any items needed during our stay. We kept referring to the bungalow as our home during our stay because it truly felt like our home away from home. So amazing! Greg is an awesome host too... Very responsive and personable! Mahalo Greg. Very clean and quaint--Justine the cleaning person does a great job in keeping things clean and pleasant for guests. Close to beach and easy to access all the fun things on the north shore. This bungalow was the perfect getaway for my husband and I. It was close to our daughter in Laie. And a short walk to the beach. When the electricity went down due to a storm the landlord made a personal visit to make certain that we had everything we needed. Will definitely be visiting again! Beautiful beach. Great food nearby. Located on the southern border of Laie, near a great swimming beach called Kokololio Beach and within walking distance to grocery stores, restaurants, bus stops and the beach park with restrooms and showers. 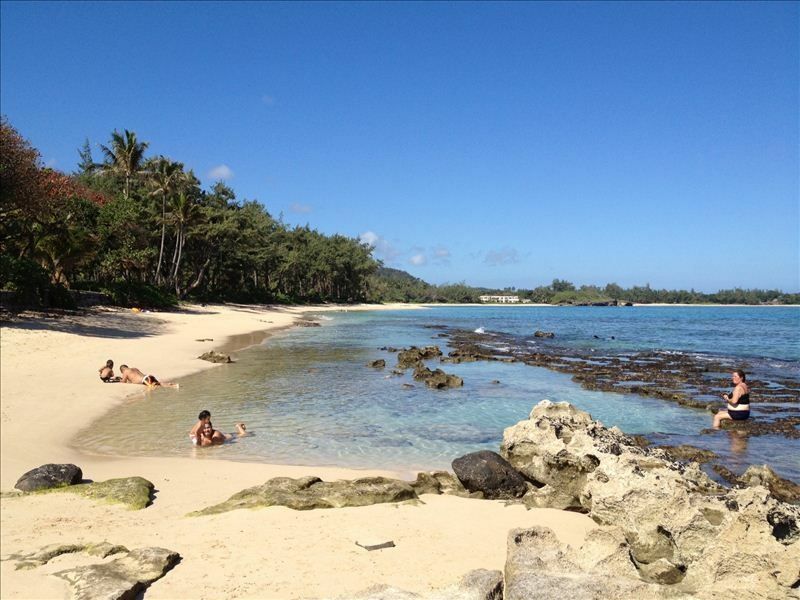 Other nearby beaches include: Laie Beach, Bath Tub Beach, Hukilau Beach, Goat Island & Malaekahana. Drive a little farther north to the famous big surf beaches like: Sunset Beach, Pipeline and Waimea Bay. The Polynesian Cultural Center is just within a mile away with it's fabulous luau. Other area attractions include: LDS Temple, BYU Hawaii, North Shore Farmers Market, Turtle Bay Resort for tennis and golf, Haleiwa Town for finer dining, rental activities/excursions and shopping, Kualoa Ranch for horse back, ATV and jet ski riding along with movie tours. Cancellation Policy-A full refund is given (less a $250 cancellation fee and the VRBO fees) if cancelled with more than 60 days before check-in. If cancelled with 60 days or less before check-in, a refund (less a $250 cancellation fee and the VRBO fees) is only given for those days I can re-book with other guests. If guests require a change to their reservation (change reservation dates, reduce the amount of guests, etc.) a one-time $50 change fee will apply per change.